Type an expression involving x - for example, x^2+4 - and press ENTER. Then press Ans (by pressing Shift+); [Template key]; ["with" operator]; x; =; 2; ENTER; (semicolon separates key presses). Could they be different settings? By the time you get to your second line, Ans is "8", not "x^2+4". Try entering just "x^2+4" as your first line, without the "with" operator; then enter your second line. Do you still get "8"? (12-16-2017 08:24 PM)Nigel (UK) Wrote: By the time you get to your second line, Ans is "8", not "x^2+4". 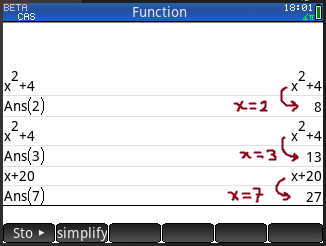 Try entering just "x^2+4" as your first line, without the "with" operator; then enter your second line. Do you still get "8"? (12-16-2017 02:52 PM)DrD Wrote: Did you try using Ans, instead of ANS? Then capitalization is important. I think it looks like working, but your last, produced by x^2+4|x=2, Ans was 8, so Ans|x=2 has no chance to give a wrong answer. numbers match the display mode. Ans(n) returns the nth entry in the Home view history. 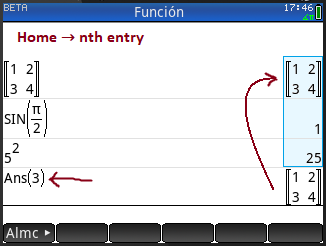 element in row m and column n.
If you want to replace an equation in Ans, replace it directly. (12-15-2017 04:19 PM)Anders Wrote: Any chance we will get an updated "user guide" .pdf with the final version? Yes I am aware about the ftp site for years. The point is that I'd like to get an answer from Tim / HP what the plan is. For example: stuff like the z transform functions have been undocumented in the user guide .pdf since day 1... the list of undocumented "stuff" goes on and on and gets extended with every new function added with every new release.... And yes I know they (invztrans, ztrans etc) are "semi"-documented in the calculator help file but that is not what I am talking about. (12-16-2017 11:47 PM)Carlos295pz Wrote: CAS "|"
subst() seems to work as expected and it doesn’t have the Ans problem either. Are | and subst() supposed to be equivalent? (12-17-2017 09:44 PM)Nigel (UK) Wrote: Are | and subst() supposed to be equivalent? Vars returns value instead of the variable name. It had happened to me with a procedure that I can not cause again, but I have achieved it in a way that I am sure I did not do before. Removing the value insertion in Units causes insertion by value in Vars, to cancel this change you can re-enter Units, or also enter once to the toolbox (which is where I believe I caused the same behavior before). Is there any way for Vars to do this without being generated by a bug? I'm not sure if in previous versions this also happened. (12-19-2017 07:22 PM)Carlos295pz Wrote: Vars returns value instead of the variable name. I beleive you've found a remaining case that needs disabling. Previously, you had a toggle for "VAL" in the vars menu. That has been replaced by the "Catalog" key as returning the value of a variable really was an extreemly limited use case that doesn't really provide much value. We removed it to bring in the much more helpful Catalog key, but one of the cases is still checking and returning the value obviously still. I will remove that bug. Thank you! In what way? They are tied with the system COPY/PASTE, not the calculator copy/paste menu. Can you explain more? (12-20-2017 10:42 PM)Tim Wessman Wrote: In what way? They are tied with the system COPY/PASTE, not the calculator copy/paste menu. Can you explain more? I just noticed that it only happens when the title bar is hidden. I have another question, how do I eliminate a Poll sent to the calculator? So far I can not get it out of the Menu view. Some time ago, when the team goes into suspension, the work session in the Connectivity kit is lost, can this be corrected? (12-20-2017 10:58 PM)Carlos295pz Wrote: I have another question, how do I eliminate a Poll sent to the calculator? So far I can not get it out of the Menu view. Rebooting will get it out of there. They are very tiny on the calculator so it shouldn't use much memory for you. Another thing I noticed when Android title bar is hidden, pressing Enter on a Bluetooth keyboard or Chromebook keyboard executes the command line (good). When Android title bar is shown (default mode), Enter from keyboard displays the application menu instead of executing the command line (annoying). On a Windows 10 machine the Window's Store Pro or Free app, Enter from the keyboard seems to always work until I use icon to make full screen. Then how Enter on keyboard works depends on whether it is show or hide title. Although sometimes it seems to always execute the command line even when in full screen mode.